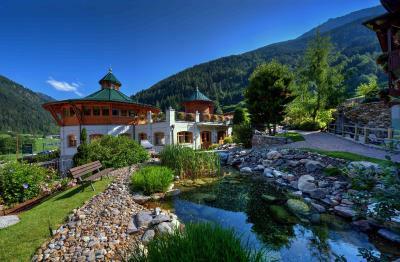 Lock in a great price for Kristiania Pure Nature Hotel & Spa – rated 9.2 by recent guests! Bardzo miła obsługa na każdym poziomie zajmowanego stanowiska, od boya hotelowego, kelnerów do właścicielki, która czuwa na jakością świadczonych przez jej hotel usług. Nie ma biegających dzieci po korytarzach jak to często bywa w hotelach wypoczynkowych. W hotelu są dzieci, ale widać, że rodzice sprawują nad nimi opiekę. Bardzo dobra narciarnia. Dogodne parkingi. Smaczne śniadania. Skibus podjeżdża pod sam hotel. Blisko do stacji narciarskiej Peio. Miła i kulturalna obsługa w spa. La camera che avevamo era al terzo piano che è stato fatto nuovo nell’ 2018 ed era stupenda!!!! Lo staff disponibile e molto gentile!!!! Consiglio a tutti!!!! Das Hotel entspricht dem erwarteten Stil- regional entsprechend. Mit viel Holz - sehr ansprechend. Siamo andati per il weekend del 2 giugno, io e il mio fidanzato ci siamo trovati molto bene, struttura pulitissima, spa grande, personale gentilissimo, cibo molto buono.. Io ho anche fatto un massaggio a pagamento e la ragazza è stata molto brava. Ci torneremo sicuramente più avanti. Das Hotel scheint neu umgebaut worden zu sein und sieht sehr schön aus. Das Personal (Reception, Frühstücksraum, Reinigungspersonal, ...) war sehr freundlich und hilfsbereit. Das Frühstück war reichhaltig und es gab fast alles, was das Herz begehrt. Ich hatte ein Top Zimmer mit Aussicht auf das Dorf von Pejo. An einem Abend hatten wir ein Galadinner, welches absolut lecker war. :-) Den Spa-Bereich konnten wir, zeitlich bedingt, leider nicht nutzen. ottima la Spa con piscina sia esterna (fredda) che interna (riscaldata) con zona idromassaggio, portatevi la cuffia (costa 3 euro) e se volete l'accappatoio si noleggia sempre per 3 euro. Vengono forniti teli e ciabattine. 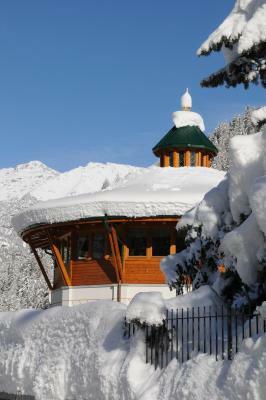 Diversi tipi di sauna e bagno turco. Camere molto accoglienti ed insonorizzate, prezzi del frigobar non eccessivi. Colazione veramente abbondante e molto varia sia dolce che salata. Un Ottimo Hotel per rilassarsi e fare escursioni nei paraggi. Ampio parcheggio sia coperto che scoperto. La card obbligatoria è un affare, col costo di un euro al giorno si hanno un sacco di sconti e le funivie gratis. Kristiania Pure Nature Hotel & Spa This rating is a reflection of how the property compares to the industry standard when it comes to price, facilities and services available. It's based on a self-evaluation by the property. Use this rating to help choose your stay! 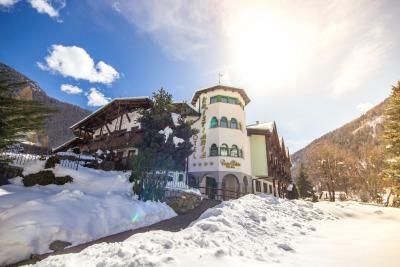 Kristiania Pure Nature Hotel & Spa is located in the Val di Sole, a few feet from the ski elevators to the Biancaneve slopes. A free ski bus is provided during winter. 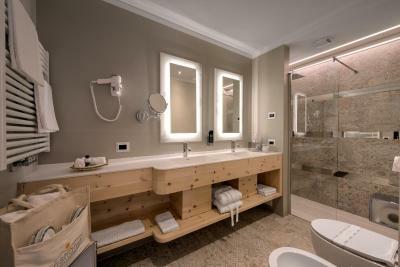 All rooms at the Kristiania Pure Nature Hotel & Spa come with a balcony, satellite TV, a mini-bar and private bathroom. Some rooms offer views of the mountains. 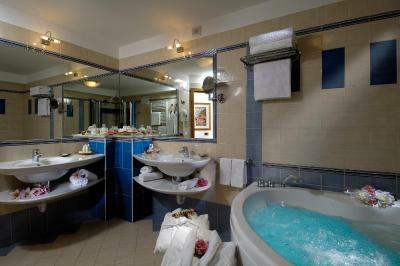 Beauty Center Acquaviva includes an indoor swimming pool, hot tub, Turkish bath and saunas. 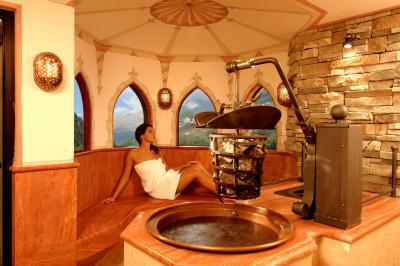 Personalized beauty packages and massages are available and there is also a fitness center. A buffet continental breakfast is served every morning at Hotel Kristiania. 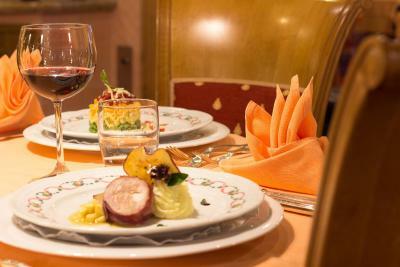 The restaurant serves Trentino dishes for lunch and dinner. The Kristiania is in the Stelvio National Park. Guests can take the free ski bus to the Peio ski elevators, just 1.9 mi away, and the Marilleva - Folgarida ski area, 5 mi away. 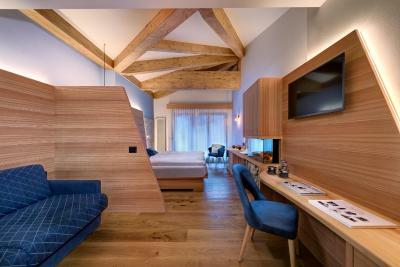 When would you like to stay at Kristiania Pure Nature Hotel & Spa? 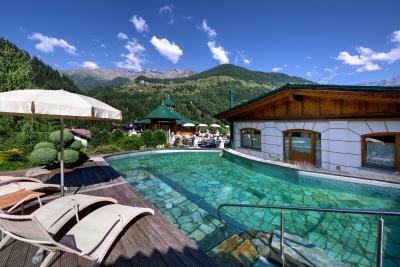 Large suite with spacious lounge and a balcony with panoramic mountain views. It offers 2 satellite TVs, a mini-bar, and an private bathroom. Large room with satellite TV, mini-bar, and private bathroom. It comes with a private balcony overlooking the inner courtyard. 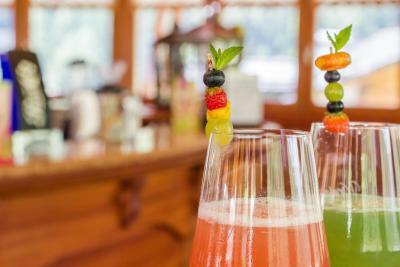 House Rules Kristiania Pure Nature Hotel & Spa takes special requests – add in the next step! Kristiania Pure Nature Hotel &amp; Spa accepts these cards and reserves the right to temporarily hold an amount prior to arrival. Kristiania Pure Nature Hotel & Spa accepts these cards and reserves the right to temporarily hold an amount prior to arrival.